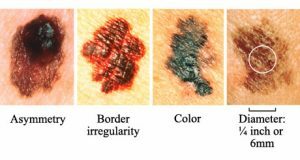 Skin cancer is the most common form of cancer in the United States and involves abnormal growths of skin cells that can form anywhere on the body, but most frequently appear on skin that is exposed to the sun. There are more than a million new cases of skin cancer in the US each year. Although most cases of skin cancer can be successfully treated, it is still important to keep skin safe and healthy and try to prevent this disease. There are three major types of skin cancer that affect associated layers of the skin. • Squamous cell carcinoma affects the squamous cells, which are just below the outer surface of the skin and serve as the inner lining. • Basal cell carcinoma affects the basal cells, which lay under the squamous cells and produce new skin cells. • Melanoma is the most serious form of skin cancer and affects the melanocytes, which produce melanin. Source: NCI Visuals Online. Skin Cancer Foundation. Everyday skin cells die and new ones form to replace them in a process controlled by DNA. Skin cancer can form when this process does not work properly because of damage to DNA. New cells may form when they are not needed or older cells may not die. This can cause a growth of tissue known as a tumor. DNA damage is often a result of ultraviolet (UV) radiation from sunlight or tanning lamps. Since skin cancer can sometimes affect areas not exposed to the sun, heredity may also be a factor. Certain factors, such as fair skin, moles, a weakened immune system, and age can also increase the risk of skin cancer. It is important to see your doctor if you notice any skin changes. Early detection is valuable in successfully treating skin cancer. Regular full body screening is recommended as well. A biopsy is performed to properly diagnose suspected cancerous growths. Other treatment options are also available, including new methods that are currently being studied. Although most treatment for skin cancer is successful, new tumors can still form. It is important to practice preventive measures and see your doctor on a regular basis. You can also perform self skin checks to spot any changes as soon as possible. If you are interested in learning more about any of our Dermatological procedures, call 302-633-7550 today to schedule an appointment.